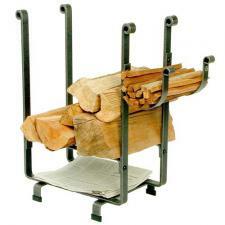 *Beautiful craftmanship in this wrought iron log holder. *This rack features a clean and traditional design, with hand-forged rolled ends. This rack also offers a handy kindling and newspaper holder. *Measures 25" Long x 13" Wide x 27" High. *Quality product made by Enclume in the USA - 27 lbs.